Did you know 14th-20th May is National Vegetarian Week? You could sit and debate about what diet is best. Or you could simply join in and eat more veg. In fact, weeks like these are the perfect time to get out of a rut, beat the food routine and tuck in to something new. And you’ll smash through that 5-a-day target! Here’s a sneak peak at what I’m planning to put on my plate. Many of us are stuck in a dietary rut. Can you believe 6 out of 10 people in the UK eat the same foods every day? No wonder the number of foods we eat is particularly low. Just consider, the average Australian eats just 15-18 different foods in a week. Honestly, do you eat more or fewer than this? I think it’s one of the reasons why many of us fail to reach the dietary targets of 5 servings of vegetables and fruits each day. The limited number of foods we’ve chosen to eat has simply bored us to tears! In fact, between 2005 to 2011, the portions eaten per person per day actually decreased; from 4.4 down to 4 in the average household, and from 3.5 down to 2.9 in lower-income families. They do it differently in Japan, instead of focusing on portion sizes the Government recommendations for a healthy diet are to eat ’30 or more different kinds of foods daily’. This might seem overwhelming, but it doesn’t have to be. In fact, I have a sneaky suspicion that this week I’m going to come pretty close. It’s National Vegetarian Week, so I’m joining the 2% of the UK population which is vegetarian, and ramping up the amount of vegetables in my diet. I also plan to eat foods that I don’t usually pick. Well variety IS the spice of life! With more grains, vegetables, spices, herbs, nuts, seeds and fruit on the list, this 30-foods-a-day target is definitely in reach. Eating more fresh vegetables means more time prepping and chopping. I don’t want to spend too much time in the kitchen, so I’m doing this in one go. So a trip to the shops comes first, and the stagger home laden down with sweet potatoes, butternut squash, carrots, red onion, cauliflower, celeriac, celery, cucumber, lettuce, spinach, fresh parsley and basil, tomatoes, (avocados were rubbish so I’ll get them later), halloumi and feta cheese, eggs, walnuts, pumpkin seeds, ponzu sauce, lemons and limes, and a few tins of chick beans and red kidney beans. I’ve got rice, buckwheat and quinoa at home. Then a frenzy of chopping. Almost all the root vegetables got sliced, diced and roasted. If you’re not using tins, then soak and cook your beans. You could even cook a few portions of rice or quinoa now too. With all the prep work done store most in the fridge and some in the freezer, and you’re pretty much ready to go. I usually head to my local health store, to stock up on super-nutrient-dense-foods. This week spirulina, protein powder, lucuma, bee pollen, frozen wild strawberries, goji berries, mulberries, chia seeds, pumpkin seeds and cacao nibs would all make it into my basket. There is always time for breakfast. In fact, when it looks and tastes this good, getting out of bed early so there’s time to enjoy it, is even more appealing. Start as you mean to go on. To me that means: not too much sugar, a sensible mix of carbohydrates, proteins and fats, and something raw. Colours should pop, taste buds should tingle. 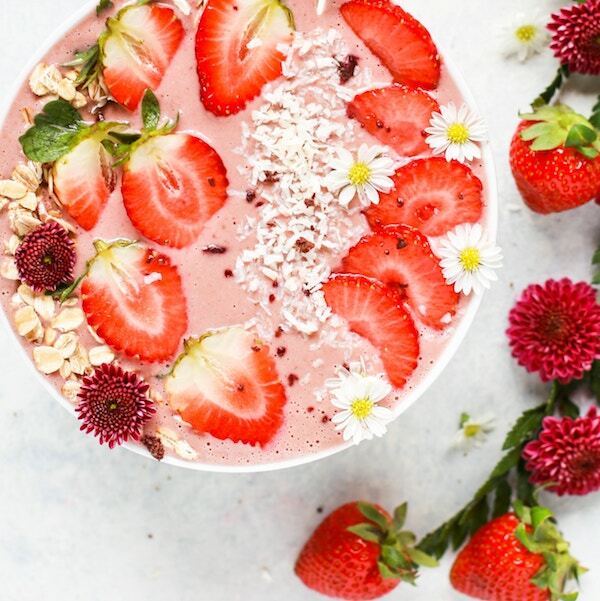 Use frozen spinach leaves, strawberries and banana if you prefer a chillier start to your day. If not, blend in the evening and keep in the fridge overnight – it will be a few degrees warmer. I LOVE Japanese food. It’s a love that will never die! Seaweed salads are top of my list, and I’d happily eat them every day. Buy them from a Japanese restaurant or local store and they’re really expensive. Instead I buy a mixed Japanese Sea Vegetable Salad that needs rehydrating. There are roughly 8 servings in a single bag – absolute bargain if you ask me. Best dressed with a soy sauce and ponzu dressing (aka Moni’s Saucy Citrus Splash), I’ll eat this with black rice noodles, avocado and tofu. Sea vegetables are particularly rich in the trace mineral, iodine. 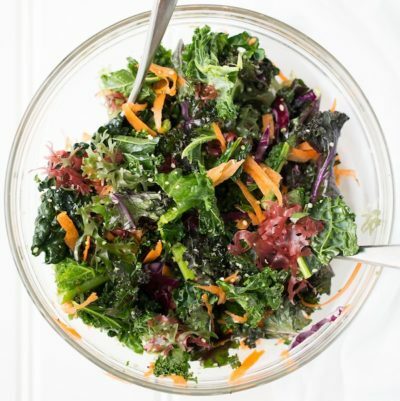 Considering its importance in the body – iodine is the backbone of the thyroid hormones, and contributes to metabolic function, energy levels, immunity, detoxification processes – it’s no wonder iodine-rich foods are essential to health. On the beauty-front, iodine helps skin and hair to remain smooth and shiny. According to the WHO, 72% of the world’s population have an iron deficiency. I’m much happier if I can avoid using plastic around my food. That’s why a lunchtime salad-in-a-jar is the bees knees. And it looks really pretty too. 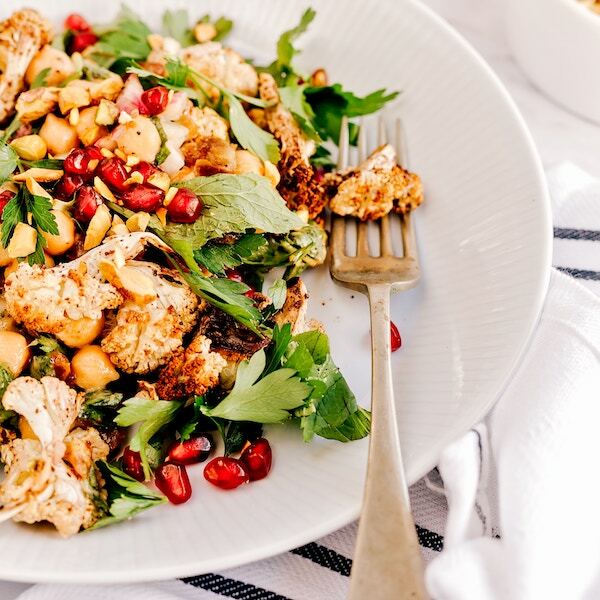 Put grains, pulses and dressing in first, then work your way up with the chopped ingredients. I think it’s best to put the leaves in last, so they don’t swim in the dressing and go limp. A common concern when eating a vegetarian diet is whether there is sufficient protein. The real question is whether the diet delivers enough complete protein; whether you’re getting sufficient amounts of the 9 essential amino acids (the type we have to get from our food) for the body to be able to dip into its amino acid pool and assemble the right types of usable proteins, exactly when they’re needed. This amino acid limitation is very common with grains and pulses if you eat them separately. But what happens when you combine them? AMINO ACID ALCHEMY! Eat them together and you make a complete protein, which gives you exactly what you need. 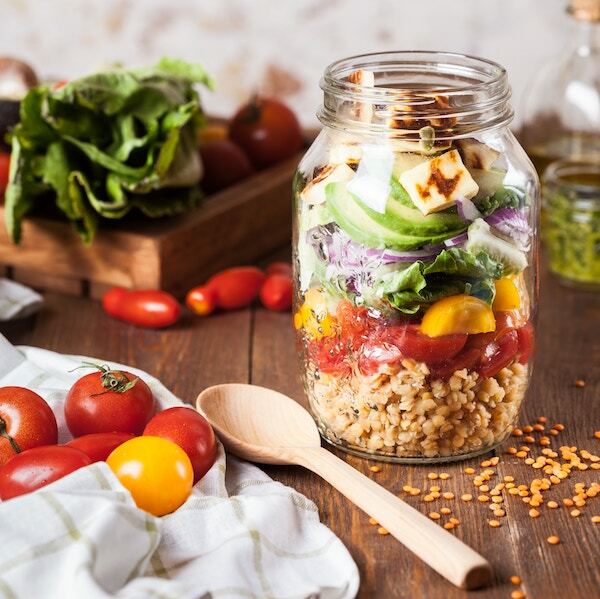 So make sure to add grains AND pulses to your salad-in-a-jar. 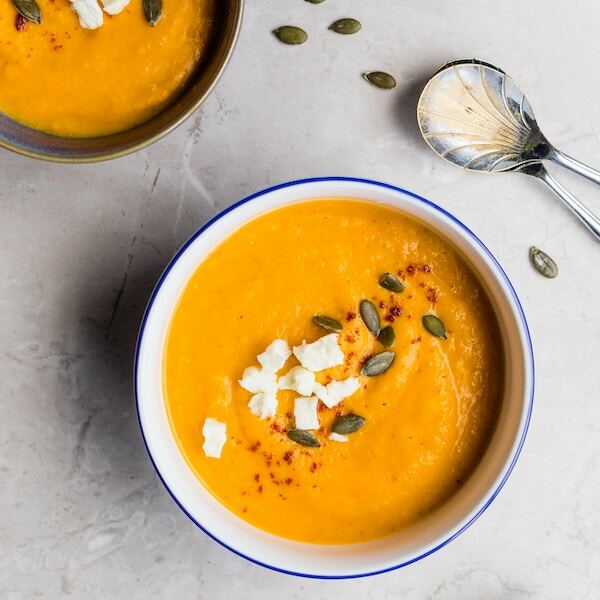 Nothing beats a bowl of pumpkin soup – it’s sweet, earthy flavours perked up with a hint of chili. It’s a perfectly simple end to a long, late day. If I’m particularly hungry I’d grab some leaves, crusty bread, cheese and olives, and have a feast. I think pumpkin and squashes (and beans and lentils) are really underrated. Too rooty, or sloppy, or bland and boring. But pumpkins are rich in beta-carotene (hence their orange colour) and have more potassium than a banana – great to recover after a workout. One serving provides 200% of your RDA of vitamin A which contributes to sharp vision. And then there are the seeds – you’ll find heart-friendly phytosterols, mood-supporting tryptophan, and plenty of plant protein here. And don’t forget the fibre. Although men and women are recommended to eat 38g and 25g of fibre each day, most of us struggle to meet this. Unfortunately, low fibre diets are associated with an inreased risk of bowel cancer, heart disease and type 2 diabetes. Eating more vegetables will help fill the gap. There’s 2g of fibre in a serving of pumpkin. Dig in. After a traumatic run-in with cauliflower cheese at an early age, I very rarely eat this veg. But I was served some recently that was surprisingly nice. Firm but charred from a hearty roasting. I did say I wanted to eat some different things. I guess now’s the time to give it a try. Rosemary, turmeric, garlic, cinnamon, ginger, cumin, parsley, basil, coriander – spices and herbs are often overlooked, but used wisely they’ll make your meals sing. Of course they have many health benefits too. From anti-viral, anti-oxidant and anti-inflammatory actions, to suporting the regulation of blood sugar levels. For instance, you’ll probably be aware of turmeric, but recently there’s a lot of noise being made about rosemary, with studies suggesting it’s positive effect in digestion, memory and concentration, and protection of brain cells. Just lovely. Ooh, love the shoutout to Moni, thanks. Also, try roasting thinly sliced sweet spuds in my secret recipe sweet pepper sauce. It sets your taste buds a tingling.